It’s a story with a sad refrain: a neglected old dog (or old cat) sits alone in a shelter, hoping for a second chance at life. For one such dog in a rural Tennessee community, that second chance came in the form of a retired Air Force veteran and longtime animal lover. Growing up on a farm in a small town in Pennsylvania, Zelva – who likes to be called Zee – always had a strong connection with animals. “They have been a comfort to me most of my life,” she says. Long after her retirement from the military, Zee finally had time to volunteer and dedicate her life to animals in need. She started by walking dogs at her local shelter; two days a week quickly turned to five. Eventually she found herself working the front desk, at the surgery center, and helping with adoption and vetting. Although a full-time employee now fulfills most of these responsibilities, Zee simply found other ways to help. The Air Force veteran found new channels for her passion and now serves as Vice President of the Smokey Mountain Animal Care Foundation, a nonprofit that supports the Blount County Animal Shelter. In this capacity, Zee gives new volunteer orientations, and serves as the McGhee Tyson Air National Guard Base liaison for non-commissioned officers performing community service at the shelter. Zee’s love of animals was not always so well received. She smiles when she thinks about the one time during her long military career when she got in trouble. Shelley was rescued from a dog trap set by animal control officers to catch wild dogs. 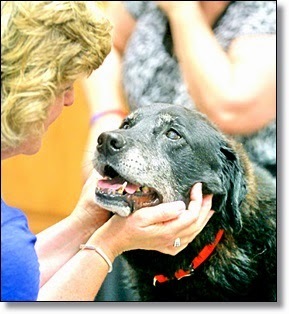 It was immediately apparent that the old dog was not wild, but an abandoned, severely neglected pet. The Shepherd-Lab mix was in pretty bad shape when the officers took her to the Blount County Animal Shelter for care. She had arthritis, thyroid problems, hip dysplasia, rotten teeth, untrimmed nails and to top it all off, she was heartworm positive. Zee believes that at one time in her life, Shelley had a family. The shelter staff estimated Shelley to be about 12 years old. During her otherwise unremarkable stay there a couple adopted her, only to return her three days later. Zee came from a small town where jobs were scarce. She knew that higher education was the ticket to a better life, but her options were limited after her father passed away when she was young. Then there was an uncle. He was in the special forces, and Zee always admired his travels and adventures. She decided that a military career would allow her to serve her country while creating a better future for herself. Zee started her long career in the Women’s Army Corps in 1972, working in personnel and then as a Military Police Officer. She spent a short time in the Air National Guard, and served the remainder of her career in active duty Air Force in law enforcement and administration. During her years with the Guard, she worked full-time in civilian law enforcement. Looking back on her 27-year military career, the dual Army-Air Force veteran realizes that she was a trailblazer for other female veterans. In August 2001, Zee retired after 27 years of dedicated service to our nation. She tried to re-enlist after 9/11, but her request was denied due to a lack of need in her military career field. With her children grown and with free time for the first time in her life, Zee started volunteering at her local animal shelter. 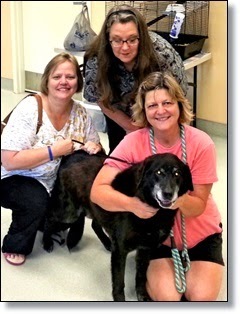 Zee first became acquainted with Shelley when the old dog was featured in a story about the Blount County Animal Shelter’s new partnership with Pets for Patriots, a nationally operating companion pet adoption program for United States military veterans. The Air Force veteran was instrumental in bringing the program to Blount County, and serves as its program manager at the shelter. Everyone thought that featuring Shelly’s plight would be a great way to introduce the community to their new partnership and, at the same time, find a veteran who might adopt this sweet yet unwanted dog. But with no response to the article, Zee could sense that being at the shelter was taking its toll on the old dog. Shelley officially joined the rest of Zee’s rescue pack: Itzy, Amos, Schnitzel, Schotzy, Tennessee, and Nutmeg. Two of the larger dogs came from abusive situations as well, and along with Shelley often spend time in the family room. 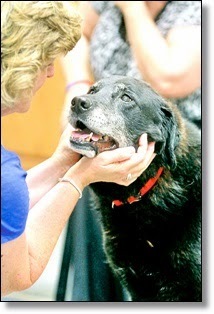 Although estimated by the shelter to be about 12 years of age, Zee’s veterinarian believes the big dog is closer to 14. That does not matter to Zee. The Air Force veteran is no stranger to adopting senior dogs and giving them happy retirements. Since joining the veteran’s pack, Shelley – often called Shelley Bear because she looks like a bear from a distance – has been settling in well. She has put on some much-needed weight, is receiving treatment for her heartworm, and is fed a high quality diet with supplements for her arthritis and thyroid. The big old dog has plenty of room to roam on Zee’s multi-acre property, and has been showing off her excellent manners. Years of neglect, however, have taken their toll. Shelley will need to have several teeth pulled. Her first real bath will come in the spring, when the lake near Zee’s property warms up. Because of her hip issues and her size – about 80 pounds – Zee is unable to lift Shelley into a tub. The dog’s physical limitations are limiting other, more enjoyable activities as well. Zee’s entire life is a testament to the power of companion pets. Long before she entered the military, animals were an integral part of her life and her family. “I grew up without a whole lot of neighbors, but we all had pets,” she explains, adding that she thinks Pets for Patriots is the way to go for any veteran considering pet adoption. “It’s a great way to get a companion animal – a super way!” she exclaims, recognizing that the partnership is good for older veterans and those returning from service alike.